Quick tutorial for those who want to change the Hostname (Computer name) in Ubuntu 16.04 Server or Desktop without a restart. 2. To permanently change your computer name, you may edit the “/etc/hostname” and “/etc/hosts” files. You may need to install gksu first via command sudo apt install gksu. /etc/hostname is a simple one line file, change the name to whatever your want. /etc/hosts maps IP addresses to host names, change the name in second line and make it SAME to the name in /etc/hostname. run xauth list command to check authentication cookie. 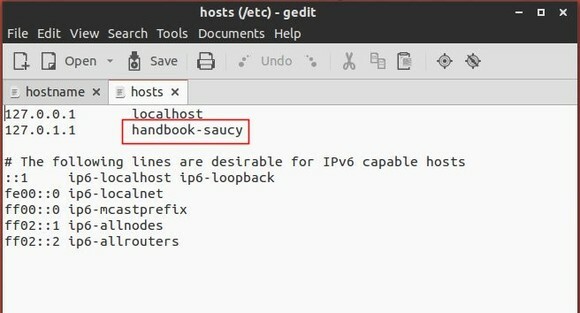 This simple and brief tutorial is going to show you how to change the Hostname / Computer name in Ubuntu 14.04 Trusty Tahr. This will change the hostname until next reboot. The change won’t be visible immediately in your current terminal. Start a new terminal to see the new hostname. For Ubuntu server without a GUI, run sudo vi /etc/hostname and sudo vi /etc/hosts and edit them one by one. In both files, change the name to what you want and save them. Finally, restart your computer to apply the changes. This simple tutorial shows you how to change computer name or hostname in Ubuntu 13.10 Saucy Salamander. The deafult name was set while installing Ubuntu. You can easily change it to whatever you want in both Desktop & Server by editing the host file. Then run command below the edit the host files. For Ubuntu Server, replace gedit with vim or other editor. It opens both hostname & hosts files in two tabs. There changes the 2 names to what you want.